Cubbie Bear is out of hibernation and delivering Valentine's gifts to Cubs fans! Show your loved one how much you care with an I-Cubs gift package delivered by your favorite, lovable bear. 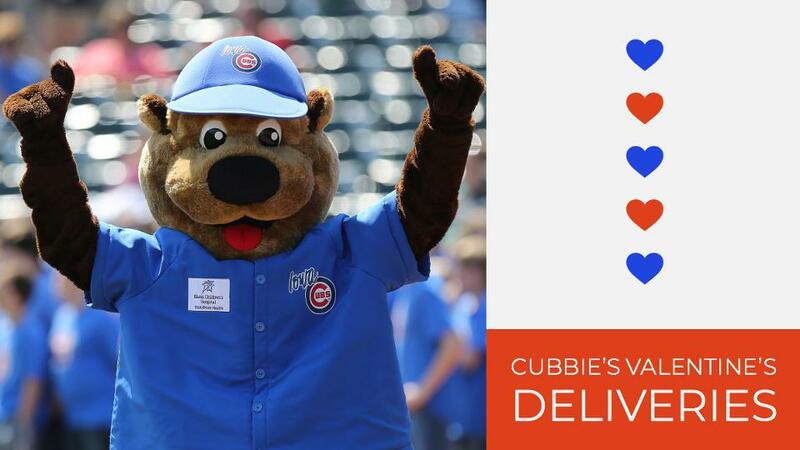 Cubbie is available from 10 a.m. 4 p.m. Monday, February 11th through Thursday, February 14th to make deliveries within a 20-mile radius of Principal Park. Packages are $75 each with delivery and $60 each without. Delivery times are first-come, first serve and are limited based on time constraints. Includes a from Chocolaterie Stam, two Reserved Grandstand tickets to an Iowa Cubs game, an I-Cubs three charm necklace, a heart Cubs adjustable hat, an I-Cubs magnet and an I-Cubs double wall tumbler. Includes two Reserved Grandstand tickets to an Iowa Cubs game, an I-Cubs adjustable hat, a Kris Bryant bobblehead, four 12oz. bottles of domestic beer, an I-Cubs bottle koozie and an I-Cubs magnet in an Iowa Cubs galvanized beer bucket. Contact Danae at 515.243.8395 or email danaez@iowacubs.com for more information or to purchase your package.